‘We have moved on from a polarised debate and single approaches to a balanced strategy focused on outcomes, based on evidence and delivered through partnership’, says home Secretary Jacqui Smith, in her foreword to the new drugs consultation paper, launched this week. Have we? That’s surely where we need to be, but there are many signs we’re not there yet. The need for evidence is constantly emphasised, underlined by the work of the UKDPC and others. Polarisation is rife, sometimes surfacing in robust debate, but all too often lurking in local treatment services with the risk of excluding those who don’t conform to an expected mould. Partnerships, when they work well can work very well (as in the screening initiative on page 14), but there are too many examples of agencies in the same area whose idea of joined-up working means cutting out the client. Things don’t often move as straightforwardly as they should within one drug service, let alone between different agencies, as Dr Chris Ford’s post-it demonstrates (page 13). The home secretary also calls for ‘greater integration across employment, housing and resettlement’, a need emphasised by our cover story. We know only too well what happens when people come out of treatment and back into a hostel of drug users. The numbers of drug users in treatment might well have doubled, but we have to make sure service users are having the best chance of permanent integration. Drugs minister Vernon Coaker urges DDN readers to participate fully in the consultation (page 8) and I hope you will seize this opportunity with both hands. 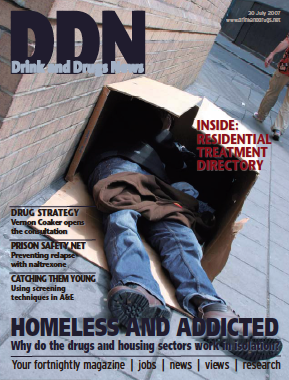 We’re taking a break from publication in August, so I would like to thank you wholeheartedly for all your support, contributions, and advertising – which enables us to keep DDN independent and free of charge to everyone in the field. We’ll be back on 10 September, raring to go with your thoughts on new drug strategy. Keep writing in over the summer!